In the scientific literature, an important place is occupied by review and analytical texts, which allows scientists to navigate in the main directions of development of the relevant branches of science, provides information support for research activities, and permits the state of certain scientific problems, as well as trends and prospects for their solutions, to be systematized. Survey and analytical activities are aimed at overcoming the contradictions between the volume of existing information and the possibilities of its perception by a man in the ever-increasing information flow. It is known that information support is the most important condition for the development of any branch of science, and review and analytical texts are a very effective tool for solving this problem. The existing ideas about such a complex concept as a review (as a type of scientific text), are ambiguous. There is no single and final interpretation of the definition of a scientific review, but some article critique examples exist. For example, a critical scientific review is a text containing concentrated information obtained as a result of selection, analysis, systematization, and logical generalization from a large number of primary sources on a specific topic for a certain period. It is also a consistent presentation of the most important information on a particular topic based on the synthesis and evaluation of information for a certain period. Review articles, according to the existing ideas, relate to the secondary scientific literature, which is devoted to the analysis, synthesis and evaluation of the information presented in the primary scientific literature related to the general theme, i.e. previously published scientific literary texts representing the results of original research, preliminary reports and other materials that meet the criteria of the primary scientific publication. In the review articles, on the basis of analytical-synthetic understanding of the results of original research new ideas, hypotheses, theories, and paradigms are often formulated. The applications of scientific reviews are varied. You can find a lot of article critique example essays on the Internet. The preparation of a scientific review is a creative process, but its effectiveness increases significantly with the use of the existing set of rules and recommendations for its preparation. Such an essay should include the main part, reference and search apparatus, source data, and additional information. The main part of the review may contain as integral parts the introduction, analytical part, conclusions, and applications. The analytical part is a mandatory element of the review. The introduction should contain the rationale for the selection of the review topic, a list of the issues addressed in the review, time limits, the analyzed period, and the types of sources of the used information. The analytical part should contain information that comprehensively characterizes the existing level of the actual state of the problem, its analysis, and assessment, as well as the main trends, directions, and development prospects of the subject of the review. Conclusions should include information on new trends and prospects for solving the problem, the consideration of which was the subject of a review. Reference materials that supplement the main content of the review may be included in the text. The development of the thematic plan of the paper should contain the rationale for the expediency of its writing, a description of the relevance of the problem to which the review will be devoted. Concretization of certain aspects of the review topic will allow defining its structure, which will include a systematic list of sections, subsections, paragraphs, and subparagraphs. The outline for a critical review should include at least two or three sections, and two or three subsections. The scientific review, the plan of which is given and fixed in sections and subsections, will allow achieving clarity and integrity in the presentation of its content, as well as save the author from losing the main line of the review. 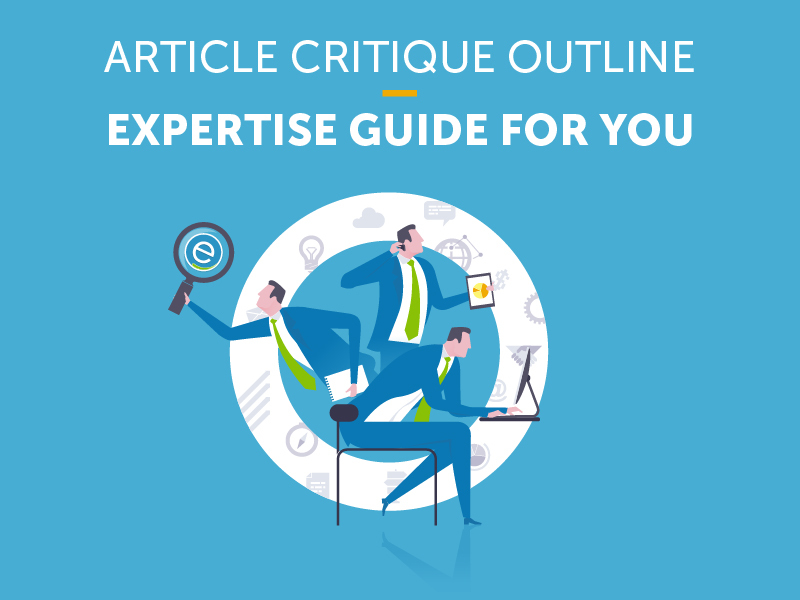 The outline of a critical article must be structured in accordance with the representing a set of keywords describing the content of the review and the name of its sections and subsections. After drawing up a plan for a scientific critique, a list of the sources of information need to be considered and analyzed. For the author of the review article, it is important to assess the quality of the source of the analyzed information on generally accepted criteria and display only such things that can be used with confidence for the preparation of the essay. It is important not to be limited to one way of searching for the necessary literature, but to use the maximum of the existing possibilities for solving this problem. Given the increasing role of the Internet search engines, the sources of found information can be grouped in one folder, where they are always easy to find. It is advisable to explore the previous critique article examples that are related to the topic under consideration; they should be referred to in the upcoming review while emphasizing the new data that appeared. In the scientific texts selected for writing the critique, fragments need to be selected and semantically grouped in accordance with the presence of specified keywords in them. The further analysis of the selected literary sources and the establishment of logical interconnections between them will make it possible to form the main text of the review, including critical remarks, generalizations, and conclusions. The logical conclusion of a scientific review article is the formulation of questions to which answers have not been received yet within the framework of the problem being analyzed, and the solution of which will make it possible to obtain new scientific knowledge. The final stage of the preparation of the essay includes editing its text in terms of compliance with logical norms, correcting stylistic, spelling and syntax errors, as well as preparing its reference part, including a list of references used when writing the paper.